Place ingredients in bread machine, use “dough” cycle. When done, punch down, knead enough to get air bubbles out (add some more flour if dough is too sticky). Place in greased loaf pan and let rise a bit more. 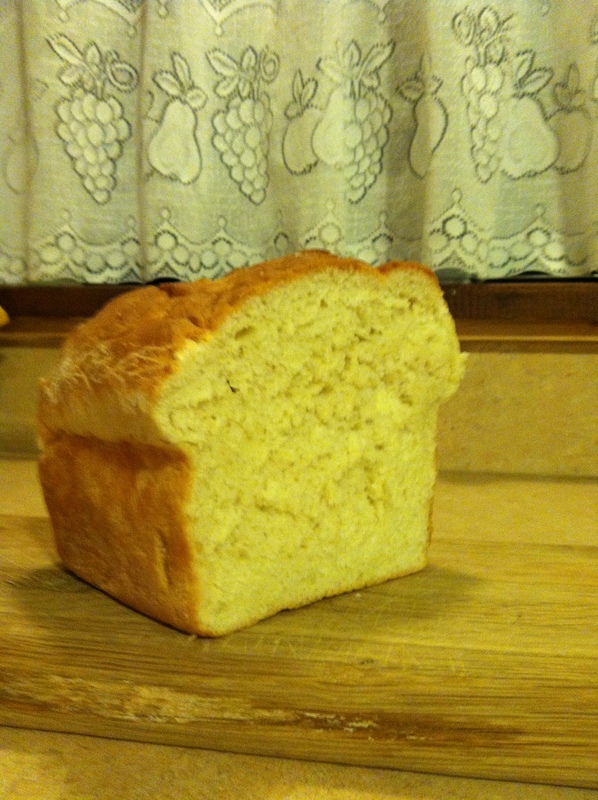 Preheat oven to 375 degree F. Bake bread for 25 minutes, until top is lightly browned. Remove from oven and brush top with melted butter to keep the crust soft. For breadmachine: place ingredients into machine in the above order, turn on dough cycle and let it run its course. Remove dough and shape into loaf. If using just one pan, it will be a very tall loaf of bread… sometimes I make one slightly smaller loaf and several rolls. Preheat oven to 375 degree F, and let bread rise. Bake for 25 – 30 minutes. Cover crust with a little butter right after baking to keep it soft.